Given that Catholic churches are often full of the likenesses of things in heaven and on earth, this seems to be a clear violation of the commandment in Exodus. Exodus 20:4 is what Protestants list as the Second Commandment. Catholics number this differently, as part of the First Commandment. The reason for this is that Catholics look at the context of this verse in light of what precedes and follows it. Whenever we look at the Bible, it is important to look at the context surrounding it. I am the LORD your God, who brought you out of the land of Egypt,b out of the house of slavery. You shall not have other gods beside me. …you shall not bow down before them or serve them. Now we can see that when the commandment is not referring to the act of carving statues, but of carving them and worshipping them in the place of God. Given that Exodus 20:5 comes right in the middle of verses about worshipping God, it makes sense to interpret it as a prohibition against worshipping images, rather than against making them. Therefore, what the commandments prohibit is not statues, but rather idols. Just as it is important to look at the immediate context of the command not to make images, it is important to look at the broader context of the Bible. What did the great heroes of the Old Testament do with images? Did they ever make images of anything on earth or in heaven? Or did they completely ban the use of such images? When we read the Bible as a whole we see many instances in which images are used in worship. In some cases we even see God commanding people to make images. The Ark of the Covenant was the place where God’s presence dwelled. When the Ark is made, in accordance with God’s commandments, it includes images of cherubim (Exodus 37:7). This is not only part of the Bible, but part of exactly the same book that contains the prohibition in Exodus 20:4. In this larger context it is clear that images of angels did not contradict the commandment about images. Why? Because people were not worshipping them. Similarly, when Solomon builds the Temple at God’s command, he decorates it with images of cherubim (1 Kings 6). We see that as the history of Israel progresses, statues and images of heavenly things (namely angels) are not opposed to worship of God. They can even be present in the very place where God is worshipped. One incident in the book of Numbers involves God specifically commanding Moses to make a statue. When the Israelites, wandering in the desert, complain against God, God punishes them by sending seraph serpents among them. The serpents bite many people and killed them. Faced with these consequences, the people recognize their sin and repent. They ask Moses to intercede for them. God tells Moses to make a seraph out of bronze and mount it on a pole. If someone was bitten, he or she could look at the bronze serpent and be healed. This is all described in Numbers 21:4-9. It’s highly unlikely that Jesus would point to the bronze serpent as a foreshadowing of himself if the bronze serpent were the result of breaking a commandment. Later, however, the bronze serpent is destroyed. Looking at the circumstances in which it was destroyed shows us more about how people should relate to the images they made. The Bible says that Hezekiah, a king of Israel, “did what was right in the LORD’s sight” (2 Kings 18:3). Among the things Hezekiah did as king, he “smashed the bronze serpent Moses had made” (2 Kings 18:4). This act of destroying an image is now one of the things he did that was right. The reason he destroyed it was that over time, the serpent had become an object of worship. It is not an image itself that is the problem, but how that image is used. But does this prove that Catholics are not violating the commandments? 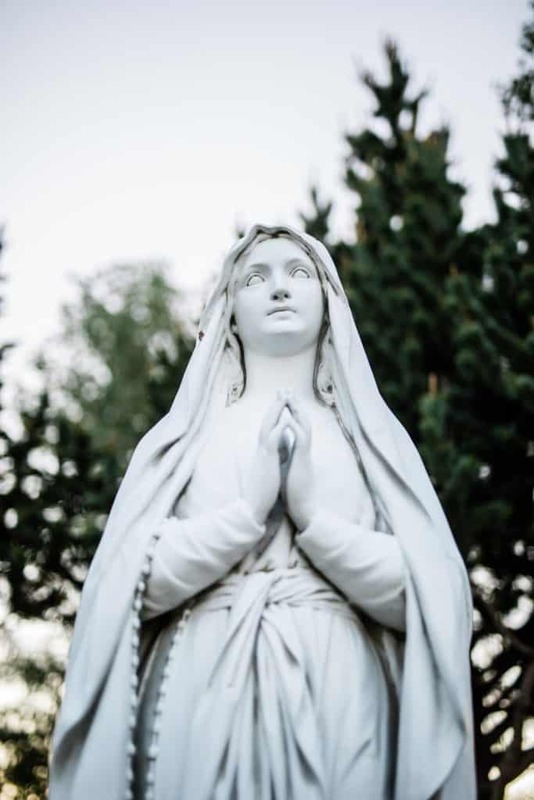 When you go into a Catholic Church you might see someone kissing an icon or a crucifix, kneeling before a statue of Mary, leaving flowers by a statue of her favorite saint, or otherwise honoring statues. Doesn’t this violate what the commandment means? When people worshipped the bronze serpent, it was right to destroy it. Even if it’s okay to have statues of saints and angels, do Catholics use them the right way? In accordance to the Bible the Catholic Church does forbid the worship of statues. Catholics may only worship Jesus; the Church forbids us to worship anyone else: angels, saints, and even the Blessed Virgin Mary. Only God is worthy of worship. We can venerate statues because of what they represent: saints, angels, and sometimes even Christ himself. However, even if the statue is a statue of Jesus, we should not worship it. The actions listed above are acts of honor for what the statues represent. We display images (photographs) of our loved ones and we place flowers at the graves and headstones of our departed loved ones. We honor these objects because of what they represent. We’re not worshipping our loved ones in honoring images and physical objects associated with them. Even if a Catholic is kneeling before a statue, this does not mean the Catholic is worshipping the statue. Joshua prostrated himself before the Ark of the Covenant (remember, this had images of cherubim on it) and prayed to God while honoring the Ark (Joshua 7:6-9). Likewise, Catholics can use their bodies to respect a statue while praying to God, and not to the statue. To be fair, God does ask Joshua to get up from prostrating himself. However, God does not ask this because Joshua shouldn’t be honoring an object with images on it. Rather, God is telling Joshua to get up and start doing things that will help God answer Joshua’s prayer. Catholics use statues, paintings, and mosaics to remind us of those who have gone before us. As saints, they point in the direction of Christ by the virtues of their lives. Reminding ourselves of them reminds us of the virtues we should try to pursue. Before the invention of photographs, man-made images were the only things we could use as physical reminders of these people. Just as Jews used graven images in the manner God commanded them to, and those who followed God’s Law in the Old Testament understood those religious images were not to be given worship, Catholics do not worship statues today.